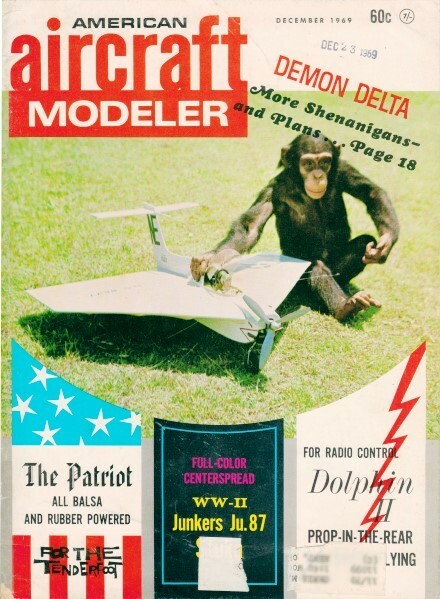 A website visitor wrote to ask that I scan and post this article for the Patriot rubber-powered free flight model. It is a simple stick and sheet balsa job that can be built for about three bucks worth of parts. 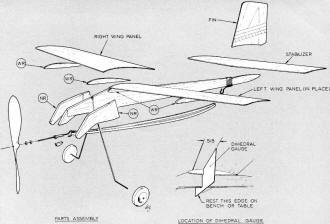 The wings uses a couple ribs on the underside to form an undercambered airfoil for a little extra lift. Enjoy! It can't lay an egg, it's an all-balsa bird. ROG's, I think, can best be described as "fun" models. They are simple to build, cost little, and can be flown most anywhere. The abbreviation, incidentally, means "Rise-Off-Ground." Light weight enables them to take most bumps and knocks without serious damage, and when properly trimmed, their flight pattern is smooth and steady, from the first burst of power, to the final dead-stick landing. Patriot is all of these. She is fast under power, steady in the climb, and most graceful and flat in the glide. But I think you'll see what I mean when you've finished building your Patriot. Construction: Before cutting material, look at the plan, starting with the illustration in the upper left-hand corner. The fuselage is composed of four parts, PC1, main fuselage, PC2, nose, and two PC's NR, all of which are cut from the piece of 1/8" sheet. These parts are assembled with the addition of the landing gear and eyelet as shown to form the nose section. (PC6 need not be cut out, but use scrap 1/8 sheet to fill the space after the eyelet is in place.) Notice that there is a notch in the top edge only of the fuselage. This notch enables the landing gear to fair in with the nose. Each one of the PC's NR is notched on the inside only in order to accept the landing gear and retain it firmly after being glued in place. 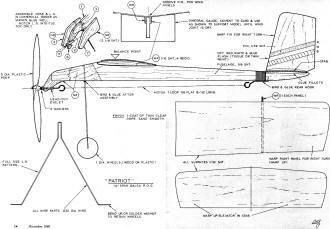 The next piece used on the fuselage is the wing rib WR. Four of these are required and are cut from the piece of 1/16 sheet. Two of these pieces are glued to the fuselage, one on each side of the wing mount. The two remaining pieces are cemented to the underside of each wing panel at the location shown on the plans. Two wing panels are required, and are cut to the shape shown on the plan. The stabilizer and fin are conventional. The wing panels, stab, and fin are cut from the 1/32 sheet. The landing gear, prop shaft, and rear hook are bent from the 1/32 dia. wire to the shape indicated on the plan. The prop shaft is bent back after the propeller and washers are placed on the shaft. 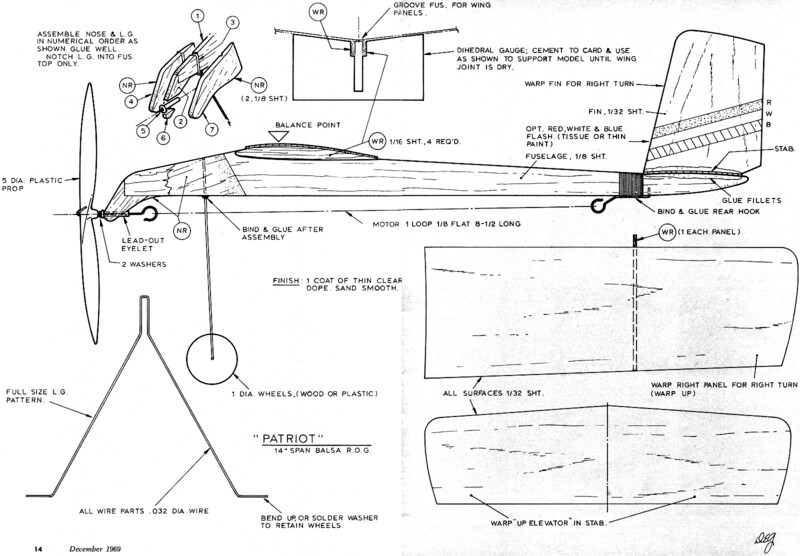 Transferring patterns from the plan: There are a couple of methods by which parts outlines can be transferred to wood. The first method which is sometimes used is to place a sheet of carbon paper between the plan and the material. The outline of the part on the plan is then drawn over with a sharp pencil and, by means of the carbon paper, the outline of the part is transferred to the wood. The disadvantage in this method is keeping the plan and the material from moving. One slip and you have to start over. The second method, which I prefer, gives you greater accuracy and easier handling of the patterns. With this method, the part drawing itself is cut directly from the plan, placed on the wood, and then is outlined by means of a ball-point pen. One thing to remember, however, is that when the parts are cut from the plan, cut them out leaving the outline showing. However, when the part is outlined on the wood, I'm sure you will notice and probably say, "The wood part is going to be bigger." Not so. When you cut out the wood part, cut to the inside of the outline of the part drawn on the sheet. If you do this carefully, you will have an exact duplicate of the part. This is where the straight-edge or triangle will be an asset. Use either for all your straight cuts of any length, being careful to keep your knife straight up and down. Another important thing to remember is, don' always try, or expect, to cut through the thicker stock on the first try. You'll get bet­ter results and take less chance of being cut by a slip of the knife, if you take it easy. On this particular model I'd recommend tracing the piece NR first. Cut this to outline and transfer it to the wood by drawing around the tracing as described above. If you don't trace it first, you might find yourself out of luck finding a complete pattern to use, because of your cutting out the fuselage outline first and, at the same time, taking part of NR with it! When cutting out the fuselage pattern, remember that the outline at the wing mount is the same as the top line of WR. When cutting out any curved parts such as the wing panels and stab., cut your curves first, and then, using the triangle or straight-edge, join the straight cuts to them. Another point is to center the wing panels, stab. and fin on the sheet when outlining. Make your cross-grain cuts first, extending them past point where they cross with-grain cuts. If you make the with-grain cuts in the same manner, the parts should come out nice and clean. Choose your method and start cutting. A small sanding block or emery board is very useful in dressing up parts after they are cut out. A dihedral gauge is provided on the plan to insure alignment of the wings and fuselage. Use it; it's important. I would also suggest pre-glueing of the parts before assembly. It makes a stronger bond. To pre-glue a part, rub a bit of cement on the edges that are to be joined, and let dry. Then apply additional cement and join together. 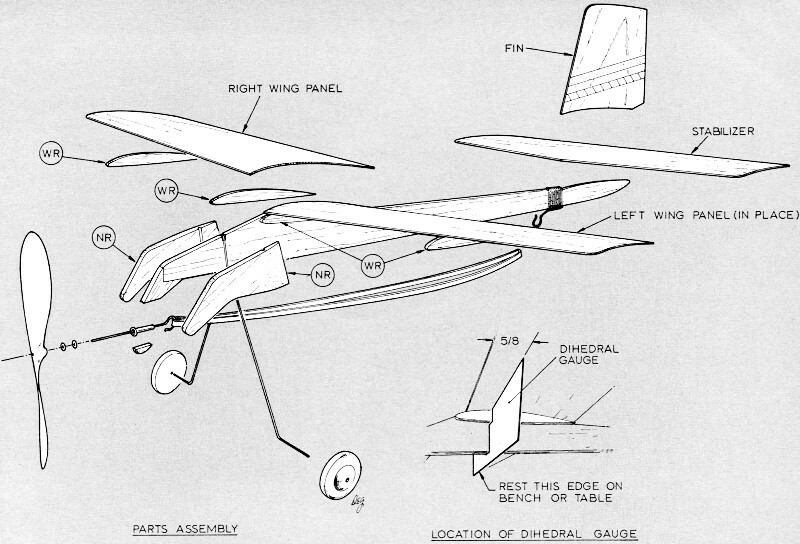 Assembly: Starting with the fuselage, assemble the nose parts as shown on the plan. Pre-glueing is important here. The eyelet will not come out if the assembly is left to set well. When the nose section is set, round off the corners and put a slight taper on the pieces NR. The fuselage's WR's' are cemented on next, making sure to keep them flush with the hump in the fuselage. When these are dry, cut the shallow "V" groove in the top of the fuselage for the wing panels. The rear hook is mounted next, taking care that the thread binding does not wander in the area where the stab. mounts. If it does, and is not corrected, the stab will be put out of the trim when it is cemented on. Rub glue on the thread as you wind it; also cement again when your binding is finished. Replace in the dihedral gauge and let dry. Remove the pins when you are sure everything is set. (Sometimes when applying fresh glue over old, the old glue will soften and release whatever it is holding; don't sweat it, just watch for it and make whatever adjustments you have to, until everything is set again. The time is worth it. Before mounting the stabilizer, lay the pattern over it and make a small cut in the stabilizer at each end of the centerline. These cuts are reference marks to be used when cementing the stabilizer to the fuselage. Before the glue sets, make sure the marks in the stabilizer are centered on the fuselage. These same marks will also be an aid for positioning the fin. Check the marks alignment of the tail assembly to make sure that the stabilizer is square with the fuselage, and also that the fin is vertical. The wheels now are installed. When all the parts have set, round off the edges of the fuselage with the sanding block. With fine sandpaper, sand the completed model and apply one coat of thin dope. Sand again when dry. Motor and propeller: Insert the prop shaft through the eyelet, the two washers and the propeller, and bend back as shown on the plan. The motor is made from one loop of 1/8 flat rubber strip, 8 1/2 long. Cut the rubber to length, and tie a square knot to join in a loop. Put one end of the loop on the prop shaft, adjusting it so that the knot comes somewhere about the middle of the fuselage, then place on rear hook. The motor, when installed, should hang slightly below the fuselage. Before winding the motor, I suggest that you secure some green soap and glycerine from your local drug store. From these a half-and-half mixture is made. This becomes a lubricant for the rubber. Rub a small amount on the motor before winding. The motor will last longer, wind better, and give you much more rewarding flights. Balancing: A pin should be inserted at the balance point indicated on the plan and adjusted so that the pin comes straight up out of the point indicated. Then note to see how the model hangs. If it is nose-heavy, weight should be added to the tail. If it is tail heavy, add weight to the nose. The bottom of the fuselage should be level when correctly balanced. The best method for adding weight I have found is the using of small pieces of wire solder cut to a length that might be suitable and placed on the nose or tail where needed. When the correct length is determined, it may be notched into the wood where feasible, and glued well. Initial glide trim: Patriot is fitted with a "lifting" stabilizer. In this form, the stabilizer contributes lift in order to hold the tail up, so to speak. Under power, this configuration gives less drag and helps to push the plane along. However, if too much lift is generated, the tail plane could override the wing lift and put the plane into a steep dive. In order to counteract this, a little up-elevator should be warped into the stabilizer. This should be done before test glides are made. 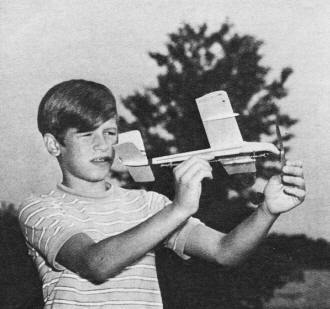 Test glide until a flat glide is achieved when the model is launched with a moder­ate push towards a point some 20 feet in front of you. This flatness of glide is mainly governed by the stabilizer, so take the time to do it, and adjust the up-warp to suit. If, during glide tests, you notice the model falling off to the right or left, correct it by warping the wing tip, or "aileron" up on the side opposite to the direction of fall. Flight characteristics: The flight pattern under power generally will be a steady climb to the right to a height of about 25 or 30 feet, or more, depending on motor winds. As the thrust reduces, she will fall off slightly in a left bank and settle either into a long flat glide, or a figure-8 pattern, depending on your individual trim preferences. The warp notes on the plan were as used on the model shown. These will vary with each individual's preference. At any rate, she does fly when trimmed out and is pretty to watch. I would recommend, however, that a right climbing turn be sought when trimming, in order to minimize propeller torque. First flights: When the glide is satisfactory, wind the motor up to about 100-150 turns, and launch slightly nose down, after letting the prop go for a few "revs." This propeller action creates a slipstream which helps greatly in the launch. Do not, however, throw the plane up in the air. After a few flights, decide on the trim desired and try winding the motor up to about 200-250 turns or so, and let her go. I think that, if you've trimmed it right, you'll be very pleased with the results. Hand-launching the Patriot gives very good flights - as far as ROG is concerned. I don't have a good runway, so I've been doing most flying by the hand-launch method. 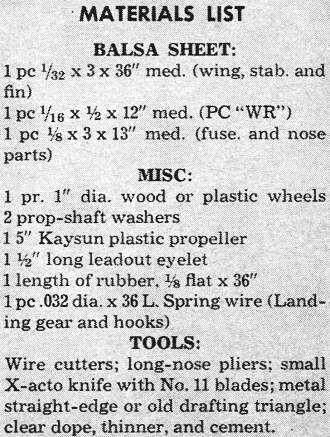 1 length of rubber, 1/8 flat x 36"
Wire cutters; long-nose pliers; small X-acto knife with No. 11 blades; metal straight-edge or old drafting triangle; clear dope, thinner, and cement.